Rio Salado College | RioNews: Earn a Business Degree in High School! Earn a Business Degree in High School! Attention high school students! If you’re a budding entrepreneur with a knack for customer service or marketing, then you’ll want to check out Rio Salado’s Career and Technical Education (CTE) business program for dual enrollment students! 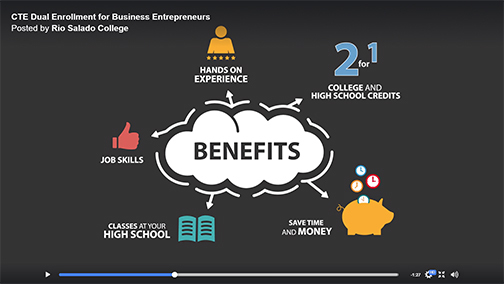 This new video will give you a brief on how our CTE classes can give you a head start on a business degree and career! With our dual enrollment program, you can earn high school and college credits at the same time! Learn more about program requirements, benefits, and how to enroll by visiting: www.riosalado.edu/dual. Rio Salado Dual Enrollment is accredited by the National Alliance of Concurrent Enrollment Partnerships www.nacep.org. The Many Benefits of Dual Enrollment!